In each test, measures taken from the neck, chest, and both legs indicate low risk of injuries to these body regions in a crash of this severity. In the test conducted by Toyota, measures taken from the dummy's head also indicate low risk of head injuries. (In the Institute's test, a high head acceleration occurred when the dummy's head hit the steering wheel through the airbag, indicating that head injuries would be possible.) Head acceleration from the roof rail hit in the Institute's test was low. Dummy movement was well controlled in both tests. During rebound in the Institute's test, the dummy's head hit the roof rail. Measures taken from the dummy indicate that a fracture of the pelvis would be possible in a crash of this severity. The risk of significant injuries to other body regions is low. The dummy's head was protected from being hit by any hard structures, including the intruding barrier, by a side curtain airbag that deployed from the roof and a side airbag that deployed from the seat. 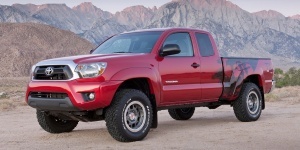 Find the used Toyota Tacoma of your choice from a dealer in your area. Search our used car listings now.